Goats love weeds. They're natural browsers who are coming back into vogue as an environmentally friendly means of eradicating brush and weeds. Any goat will eat weeds, but if you're in the market for a goat and weed-eating's a factor, you can choose among milk, meat or fiber producers and their various hybrids. If you're operating a brush goat company, hauling goats to locations, consider whether you want that dual-purpose animal. Professional caprine weed control operations prefer "brush" or "briar" goats, which are not a particular breed. Brush goats are generally a cross between a meat and dairy breed. The ideal brush goat is hardy, healthy and good-tempered. The University of Arkansas at Pine Bluff Cooperative Extension website states that in research trials, brush-type goats demonstrate stronger parasite resistance than other goats. Some brush goat operations prefer using wethers, or castrated males, since there is no concern about the safety of young kids as occurs when breeding does serve in operations. Does can also damage their udders in places with heavy brush. 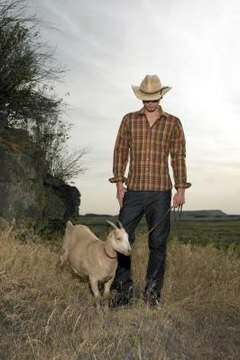 However, one advantage of a brush goat company is that you can breed and raise your new "equipment," at relatively little cost. You can't do that with a brush hog, bulldozer or tractor. If you're looking to put together a herd of goats for serious brush and weed control, think large, medium and small. You'll want representatives from various sizes of breeds so you'll have goats consuming plants at various heights. With a range of sizes, expect goats to clear weeds from the ground to about 7 feet in height. While pygmy or Nigerian dwarf goats are the obvious small goat candidates, your choices are more varied among medium-size and large breeds. A fiber breed, such as the Angora, can be a good choice for brush control. The Spanish goat is a type, not a breed. This meat goat descends from goats brought to the Southwest by Spanish explorers. "At one time, their utility for brush control was as important as their role in producing meat," the University of Maryland Cooperative Extension website says. Boer goats, a large meat breed originally from South Africa, make good brush goats. They also cross well with dairy breeds, so they're a suitable choice if you want to raise goats specifically for brush control. If you want goats for any amount of weed control, avoid goats with horns. Horned animals are much more likely to get their heads stuck in branches, fencing and debris found among the weeds. The horns can also injure fellow caprines. While dairy goat kids usually have their horns removed a few days after birth -- a process known as disbudding -- that's not as true of the meat breeds. A naturally hornless, or polled, goat is a good choice for weed control but not for breeding. The genes for polling are recessive and can lead to hermaphroditism in kids born to polled does.